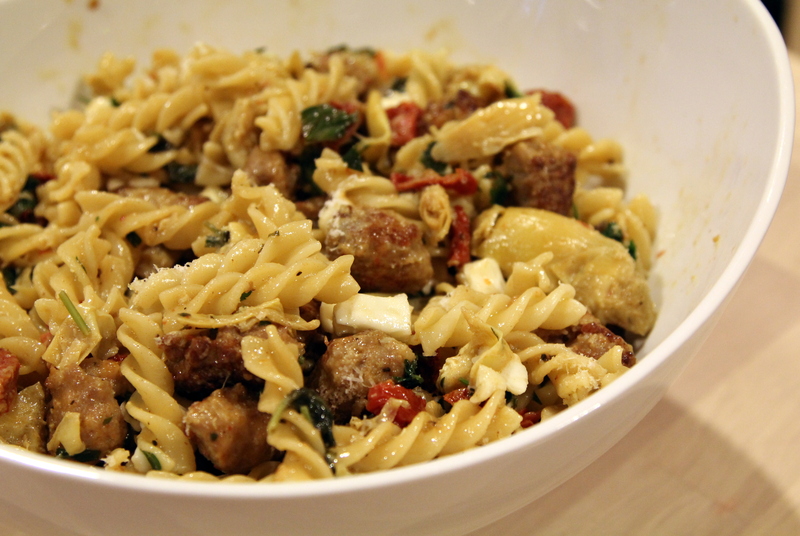 Fusilli with Sausage, Artichokes, and Sun-Dried Tomatoes [recipe] – Cin Cin, Let's Eat! I deeply miss those plates and bowls of comforting perfection from Italy….yes…I am suffering from pasta withdrawal. (That and espresso and pastry and gelato withdrawals as well…) The other day while I was thinking about those al dente noodles again, and all of the sudden, the “stress-free-Italian” Episode of Giada’s Everyday Italian popped in my head and said hello. That fusilli looked so good that it made quite an impression in my memory. After quickly looking up the recipe, I was pleasantly surprised that I had all the ingredients on hand except for mozzarella. Italian cuisine is all about simplicity and quality ingredients that each stands on its own. Unfortunately I only had cans of whole artichoke hearts on hand so to make up for it, I made a point to buy fresh mozzarella so it’ll take me just this much closer to Italy. Not much modifications were done to the recipe, except I used sweet Italian sausage instead of spicy ones, canned artichoke hearts instead of frozen ones. Wonderful dish! Perfect al dente fusilli tossed with the sweet sun-dried tomatoes and artichokes, the little bites of smokey and browned meaty sausages, and that salty, buttery mozzarella….. I highly recommend you to try it! Looks like a great meal. We had a quick pasta for dinner tonight. Yum, I love this post! Felt like I was dreaming with pasta right along with ya! Wonderful descriptions. I want pasta now!